I hope you are having a wonderful week! 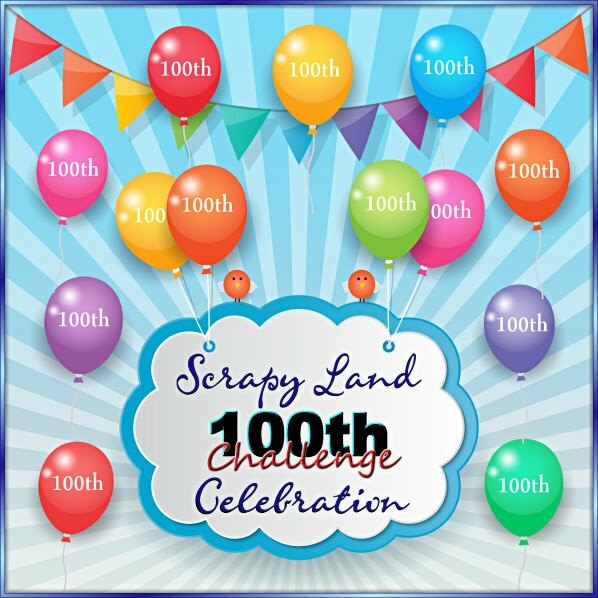 It's time for a new challenge at Scrapy Land and the challenge is: "Anything Goes" PLUS use a brand of die Scrapy Land carries....there are over 55 brands to choose from!! I have a few cards to share today that I made for a friend. The pretty papers are from Simple Stories. The background is layered with the Die Versions Hexagon Background die followed with the Spellbinders Oval Regalia die set. The sentiment is stamped with Simply Sentiments from My Craft Spot. The flowers are from Recollections and Wild Orchid Magnolias. 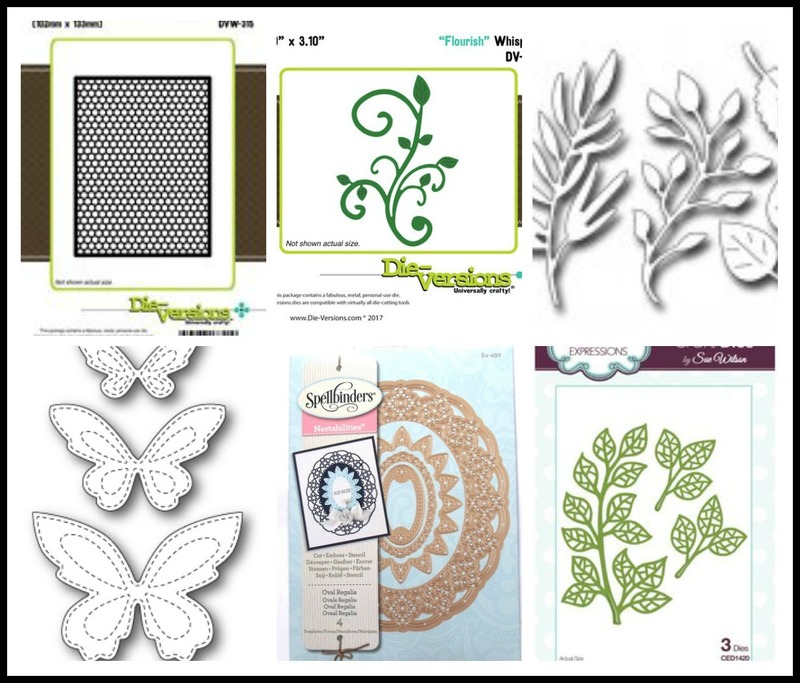 Beneath the flowers are Die Versions Flourish, Frantic Stamper Assorted Foliage and Sue Wilson Designs Mosaic Leaves. The beautiful butterfly is Poppystamps Stitched Butterfly Trio and the yummy ribbon is the Vintage Vineyard Bundle from DL.ART. Sherrie, I can't imagine the time it took to make this pair of LOVELY delicately layered cards!Such a fabulous design showcasing all those delicate die cuts! My favorite bit are those sweet stitched butterflies! Wishing you a wonderful week, my friend! Hugs! Wowwwwwwwwwwwww! These are gorgeous! LOVING the colors, the details ... JUST WOW!!!!!!!!!!!!!!!! These are beautiful! 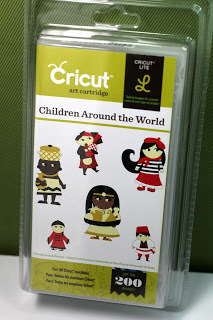 Love all the dies you've combined to make these wonderful cards. 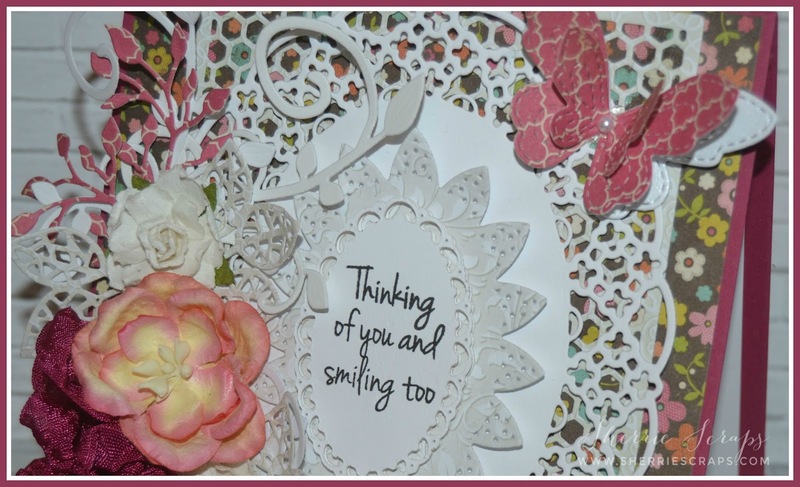 Love the sentiment on your beautiful cards! The dies and the paper you used all go together perfectly! How Beautiful Sherrie, You amaze me with your creations. Wonderful Job my friend. Happy Day to you! 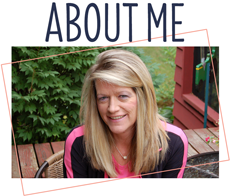 Wow, Sherrie, these are amazing!! Shabby chic perfection!! I love the colors!! You've layered the dies perfectly!! Each detail is spectacular and I love, love these!! So gorgeous, my sweet friend!! Very pretty cards, I love how shabby chic they look! The dies are amazing and those colors look fabulous! Beautiful!! 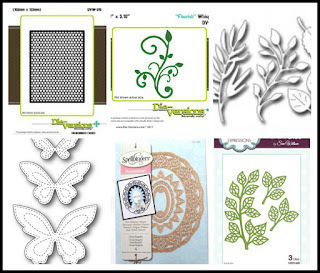 Love all those fabulous, elegant dies you used!! And the flowers are beautiful! Thanks for playing with Jo's Scrap Shack. WOWZER!!! 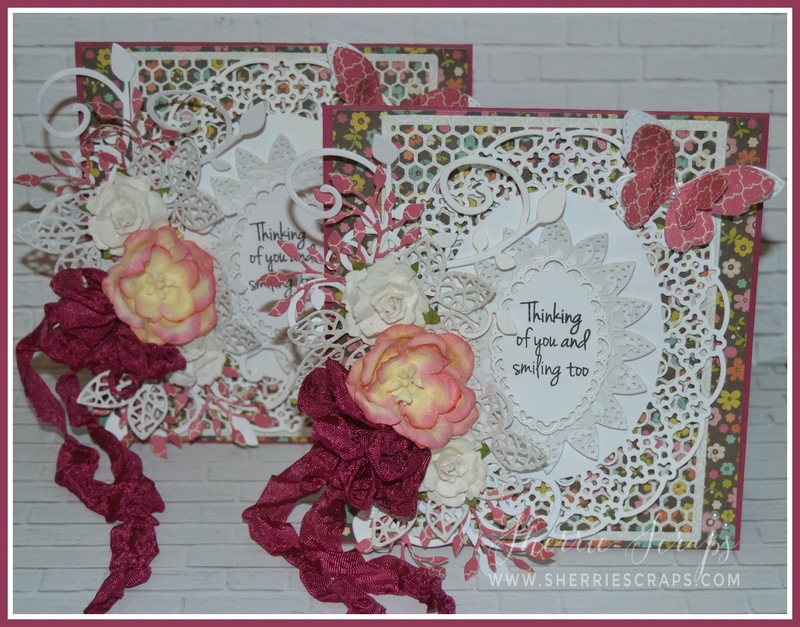 what a gorgeous card Sherrie I am so glad to see you back crafting. What a come back. I love what you did with the ribbon. Keeping you and the family lifted in prayer. Beauiful Sherrie. Love he papers, flowers, layers and textures. Love it. I love your beautiful card! I think it is one of my favorites made by you!! The flowers and dies used are so pretty!I absolutely love the butterfly trio! !Stunning job my friend!! These are so beautiful Sherrie!! Love the colours and lovely details! OmGoodness, amazing detail! These are gorgeous, Sherrie! Such gorgeousness! I'm loving all the beautiful layers and embellishments - stunning! So pretty and delicate! 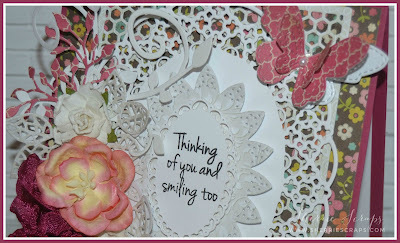 I love the pretty dies you used together here- just beautiful! Sherrie these cards are just gorgeous! The papers are so pretty and I love everything about these... just very beautiful hon!... definitely helped to cheer me up. I lost another uncle yesterday morning! This is the 6th family member of mine to pass away since Easter Sunday... and 4 of those 6 were all brothers. I am losing all my uncles man... it's been very hard and rough on my family and I ... and now we are trying to raise money for this last uncle's funeral as he didn't have any life insurance or anything....wasn't married, no kids... it's been very hard .... I have never been through anything like this in my life... to lose so many people in just a few months.... it's horrible.... so that is why I haven't been around to visit in blogland for a bit... I haven't been able to or feeling well enough to really get online much. .... so thanks so much for giving me a reason to smile. Love you! Have a great weekend and thanks for linking up for Funday Friday! Oh Sherrie, these are so lovely and elegant! Wow!!! These cards are gorgeous!! 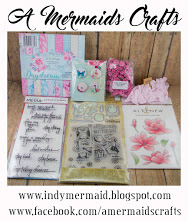 The flowers and ribbon are beautiful - and you know I always love seeing stamps from My Craft Spot! Wow! The details, the layers!!! These are amazing! Oh my Sherrie! Your card is so elegant and fancy! Love all the layers and fancy blossoms! Hope you have a great Sunday!